Please follow the below instructions for downloading and installing myanmar zawgyi font in Windows 7. Finished. This should be very easy. Good Luck. When i right clicked.. i couldnt see the option for "save target as"
you have to use IE-Internet Explorer so that you can see. Thanks. Something is wrong. Keys are not where they suppose to be meaning that when I type C, comes out sa lone instead of kha kway. And when I type R, Ya Kout comes out instead of Ma. I have no idea which keys represent what. What do I do now to get the right one please? Thanks for the reply in advance. I’m using OS X Yosemite version 10.10.5 FYI. Maybe you are using different browsers. As long as you see the word "Save", just please click it. It will work. Good luck. Hope this link will help you http://forums.crackberry.com/blackberry-os-5-4-x-f151/how-install-additional-font-556704/ . 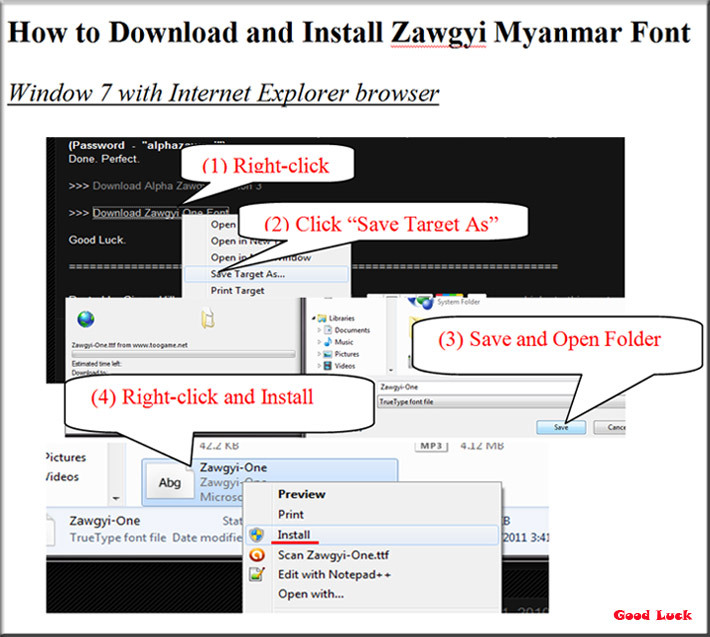 Because i want to read myanmar words..
when i install this, ask me password for installation! What is the password? thank you. Please help me to bo able to read and type Myanmar language in Window 8. Now I can read Myanmar font but can not type. Thanks. what wrong .. that ? I have already download & installed alphazawgyi version on my vista and can type myanmar font.But there are still squares on my facebook. Please use Google Chrome and go to (1) "Customize and Control ... "see http://twiturl.us/zawgyi " (2) Click "Setting" (3) Look for "Shoe Advanced Setting" at the down below (4) Look for "Web Content > Font Customize" (5) Select "Zaw Gyi" from the list. That's it. Good Luck. how do I try to download keyboard and how can I run to see and type myanmarfont .thanks a lot . I have already installed. but i still cant see and type. Want to read Myanmar language on this website. can't read myanmar font.how do it?please tell me..
From where you cannot read? On the website and which website as an example? please. i can't install the zawgyi keyboard. when i install, it's just installing and no progress. how can i fix it? I alr download and installed zawgyi myanmar font but cannot type and see mya font. How should i do? Please tell me advice. Thanks. PLEASE HELP ME ZAWGYI KEYBOARD THANKYOU. Please help me zawgyi keyboard for win 8 thankyou. Already downloaded installed reading burmese is ok but typing for burmese is not abailable why ? ?